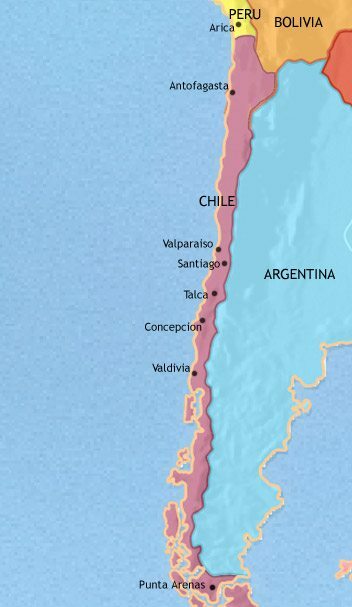 Chile has extended her borders in the War of the Pacific. The Spanish have been unable to subdue the indigenous peoples of central Chile. 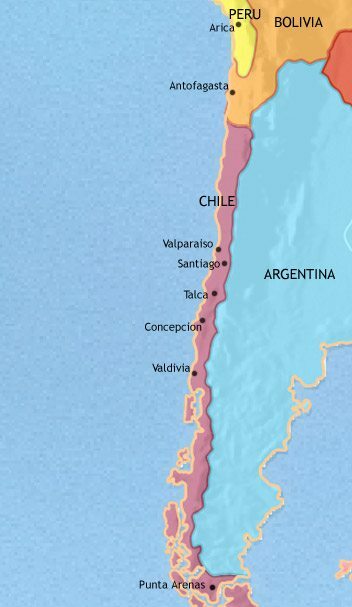 Chile remains one of the most isolated regions of Spanish America. Chile has won its independence from Spain thanks largely to Bernardo O'Higgins. Chile has experienced political stability and economic progress. Chile has experienced social, economic and political turmoil. Chile is now one of the most prosperous countries in South America. 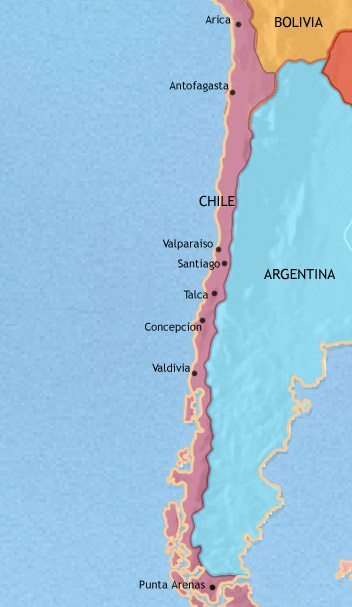 The nitrate mining boom in the far north of Chile has aggravated border disputes with its neighbours, Peru and Bolivia, leading to war with the two nations (the War of the Pacific, 1879-83). Chile won the war, thanks largely to her superior navy, and she extended her territories northward. However, the expenses of the war left the Chilean government in a weak financial state, and this caused it to seek to take more control over the economy, and specifically over the nitrate mines. This attempt was resisted by the landowning elite, and a brief civil war ensued (1891). This ended in the establishment of a full parliamentary system, initially under the complete control of the landed elite. As rival factions within this elite have competed for power, multi-party politics has evolved, reaching down into wider sections of the population and increasingly involving them in politics. A series of short-lived and weak governments have come and gone, but the political system has remained remarkably stable. The suffrage has widened to include the peasantry and the working classes, and the army has remained out of politics and under the control of parliament. 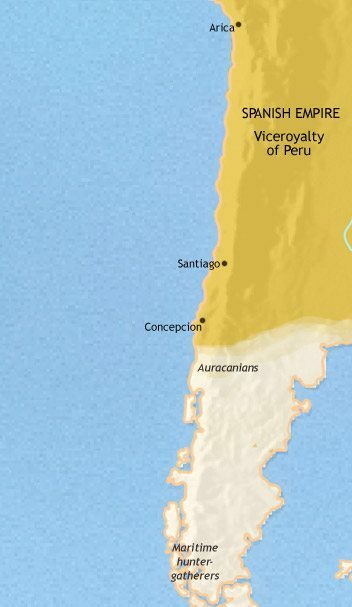 For centuries, the people of northern present-day Chile had come under the influence of the great Peruvian civilizations to the north, and had finally been conquered by the Inca empire. However, the Inca armies had been unable to subdue the warlike Araucanians, in central Chile. The north of present-day Chile quickly fell under Spanish control, along with most of the rest of the Inca empire. Further south, however, there was a different story. It took years for central Chile to be pacified. Not finding the kind of natural resources the Spanish were interested in (above all gold and silver), the settlers concentrate on farming. Ongoing clashes with the Araucanians require the Spanish to keep a large garrison in the region. The southern region is by no means fully pacified yet, with large areas still in the hands of the warlike Auracanian peoples and beyond Spanish control. 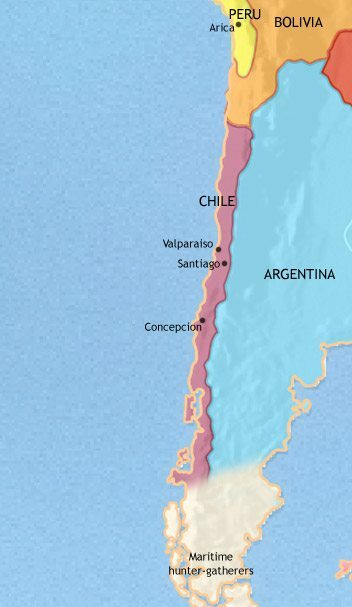 The vast majority of the population – by now overwhelmingly of mestizo (mixed Spanish-Indian) blood – is concentrated in the central area of present-day Chile, between Santiago and Concepcion. The Spanish-controlled area remains comparatively isolated. This has bred a stronger sense of regional identity than in other parts of the continent, reinforced by the homogeneous nature of the mestizo population. Chile remains one of the most culturally backward areas of Spanish South America – for example, there is as yet no printing press here – and one of the most economically underdeveloped. The economic reforms of the Bourbon regime have stimulated some trade and economic growth, and this has brought with it some expansion of the population; however, the commercial element in society remains small. The region is dominated, economically and socially, by a small group of estate-owning families who, descended from the original Spanish conquistadores, form an hereditary aristocracy in all but name. In 1810, with the invasion of Spain by Napoleon, a junta of local leaders in Santiago started governing the region of Chile in place of the Spanish-appointed governor, who resigned. The next few years were characterized by turbulent politics. In 1811 Jose Miguel Carrera seized control and became dictator, but instability remained. A see-saw struggle between Carrera and the military commander Bernardo O’Higgins dominated politics, but this period saw trade liberalised, the first steps taken to abolish slavery, newspapers founded, and education promoted. A pro-Spanish army re-imposed control in 1814. Several thousand Chileans, including Bernardo O’Higgins, escaped across the Andes into Argentina. In 1817 the liberation army of San Martin, with O’Higgins one of its commanders, cleared the Spanish forces from the region, and O’Higgins was installed as “Supreme Director” of Chile. The new leader established a measure of peace and stability within Chile, and presided over a brilliant naval campaign (under the tactical leadership of British officers) against the Spanish, and a major military expedition against pro-Spanish forces still holding out in Peru. However, once the threat to Chile was passed, support for O’Higgins dwindled. Opposition from the local landowning elite, with its interests focussed much more on Chile than on the wider pan-South American movement as a whole (with which O’Higgins was associated), led to his abdication in 1823. Some years of political turmoil followed, which caused severe economic and social disorder. In 1830, however, a new dictator came to power, Diego Portales. He engineered a compromise constitution (1833) which created a firm central government, open to strong influence from the landowners through their control of parliament. The constitution of 1833 has provided a stable political framework which has allowed Chile to make steady economic progress. Her exports are based largely on meat and cereal production, and the country has attracted considerable foreign (mostly British) investment. A nitrate mining boom in the far north of the country, on the borders with Peru and Bolivia, has brought increased prosperity since the 1860’s. Immigration from Europe (mainly from Spain, France and Italy) has doubled the population since the 1840’s. A railroad network is being constructed, a new port at Valparaiso has been built, and new roads have been laid out. Political power has resided mainly with the landowning class, through its control of parliament. Economic development has brought a new middle class into being, however, and this has political aspirations, finding expression in an upsurge of liberalism. This movement is increasingly supported by elements within the ruling class. 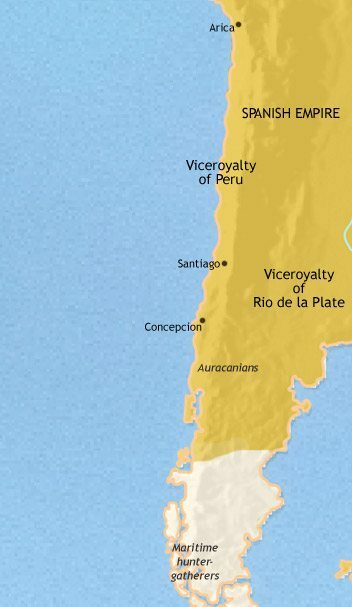 As for the Araucanian-controlled south, it has only been from the 1860’s that the Chilean government has set about a final occupation of the territory. It is aided in this by telegraphy and railroads, which are now throwing out tentacles stretching down into the far south. Nevertheless, even by this date the pacification is far from complete. In many areas, army outposts are surrounded by large tracts of land beyond the reach of the government. The demand for Chile’s chief export, nitrate, rose greatly with the coming of the World War 1, but advances during the war led to the development of synthetic nitrates. Chilean exports plummeted, putting the Chilean economy into depression. The resulting social unrest, and the conservative parties’ obstructive actions in blocking social and economic reforms in parliament, undermined support for the old elite within the country at large. The polarisation of Chilean politics between conservatives and socialists made political stability hard to achieve – and the worldwide Great Depression of the early 1930’s, in which Chile fully participated, made things worse. Short-lived governments followed, oscillating between conservatives, supported by the old landed elite, and socialists, supported by the discontented and radicalised middle and working classes. Governments were never strong enough to grapple effectively with the country’s economic problems, and high inflation and austerity programmes were the order of the day. With World War 2, and then the Cold War, the economic situation has improved markedly for Chile, as demand for its metals and other products has risen. Nevertheless, social inequalities have continued to blight the country. In 1964 the reformist Eduardo Frei became president, and introduced a wide range of reforms to tackle the country’s social problems. He nationalised the copper mines, Chiles’ main export-generator, and pursued measures in favour of the dispossessed peasantry. His efforts were only partially successful, and succeeded in radicalising Chilean politics still further. In 1970, Chile elected the communist Salvadore Allende as president. He embarked on an ambitious nationalisation programme, which brought economic chaos to the country. Alarmed by this turn of events, the army intervened, and carried out a bloody purge of Allende’s supporters. The military dictatorship which followed, under the leadership of General Augusto Pinochet, was an oppressive one. However, it was initially supported by large segments of the population, who had been badly frightened by the economic disaster and social disorder engulfing the country (including an inflation rate of 800%). Military rule lasted until 1988, during which time horrendous abuses of human rights were perpetrated. The Chilean people grew increasingly disenchanted with the military, who gradually arranged for the return to power of elected politicians – though Pinochet remained as commander-in-chief of the army for some years. Since then Chile has been governed by a succession of democratically elected governments. These have largely maintained the free-market economic policies of the Pinochet regime (designed by a group of US-educated economists known as the “Chicago Boys”), and the country has experienced steady economic progress, as well as real social gains. Chile is now one of the most prosperous countries in South America, and its society is significantly less polarised than in the past.